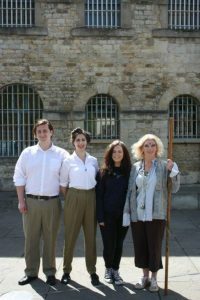 Oxford Shakespeare Festival is now underway with the first production, Twelfth Night and The Tempest, presented as two one hour plays, the first in the incredible festival line-up. 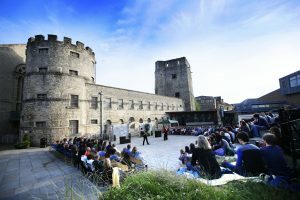 We spoke with Ashley Harvey, one of the Producers and founding members of BMH Productions, to find out about the show planning process and why Oxford Castle is such a special venue. Introduce yourself – how did you get into theatre? I trained in theatre and performance at the University of Leeds (formerly Bretton Hall). I have been a professional actor for 7 years and have been lucky enough to have worked on some fantastic productions, large and small that have taken me to theatres all over the world. I founded BMH with Ed Blagrove and another friend 11 years ago and have loved every minute of it! How challenging is it to fit a Shakespeare play into just one hour? Does it make Shakespeare more accessible and is that the main aim? It’s very challenging, but also very rewarding! You have to really focus on the main parts of the story and find everything that is integral to the plot and cut away anything else. We find that by focussing on the key plot lines in the show that does in turn make Shakespeare more accessible. The audience can clearly see what the plot is and how the characters are going about getting what they want. Can you explain your production process? When does planning begin for your show and what does it entail? The Production process involves a lot of people right from the beginning and we would be lost without everyone else who gets involved. The process starts the year before the show, usually in October to November when we try to decide what shows we want to do. We then appoint Directors and set up an audition process. Then we go appoint a Designer and ensure that the Directors and them are happy. We then carry out auditions, cast the show and set up a rehearsal schedule. Then we go about promoting the show, trying to ensure that as many people know about the show as possible. We advertise the show in a number of different places. We try to sell as many tickets as possible and work on making the shows as good as they can be. So it is a long process that involves a lot of people, but it is very much worth it when you get to see shows on in such an amazing setting as the castle. What’s your favourite part of being involved in theatre? The best part for me is watching the shows knowing how much work has gone into them. We also work with lots of people who want to to gain experience in various aspects of theatre. It’s hugely rewarding being able to give people the chance to experience their passion first hand. We’ve had lots of people work with us go on to achieve their dream of working professionally in the industry. That is really special for us and we are thrilled to be in this position. How did you decide on The Tempest and Twelfth Night? Actually we were extra lucky with these two shows as our brilliant Directors, Alex and Cate pitched the idea of putting on these two shows in partnership. We loved the idea and the prospect of putting on two shows that are linked by shipwrecks. The two shows are closely linked but also uniquely different which we thought was a great idea for the same cast to explore. We also have a brilliant Designer who was keen to work with the themes that Cate and Alex put forward. All in all the opportunity sounded like to good a one to miss! The Oxford Castle stage is quite unique – what do you like and what opportunities does it offer that other venues don’t? The castle space is just incredible. It’s really big whilst at the same time being very intimate. Nowhere else can you find such a magnificent setting as the sun sets slowly behind the castle. The audience can see the actors in a natural setting which is very powerful. It’s incredibly atmospheric and is a really special place for the performers as well as the audience. We can’t wait to be back there with Twelfth Night & The Tempest! Book now to see Twelfth Night and The Tempest for yourself! The production now runs until Saturday 1 July from 7.30pm in the castle’s historic Castleyard.